Works for me, its so weird part of me wishes he was riding that mop just for some added weirdness. stop the crop, leave the mop! Funny Romke! I think the framing of the original shot works because the mop and backdrop gives you a feel of where this child is. These are his surroundings. the crop is excellent .. no worries! a real moment and a true gem! these pix end up on book covers!!!! AWESOME!!!! I may be a year late but, It looks just right~! 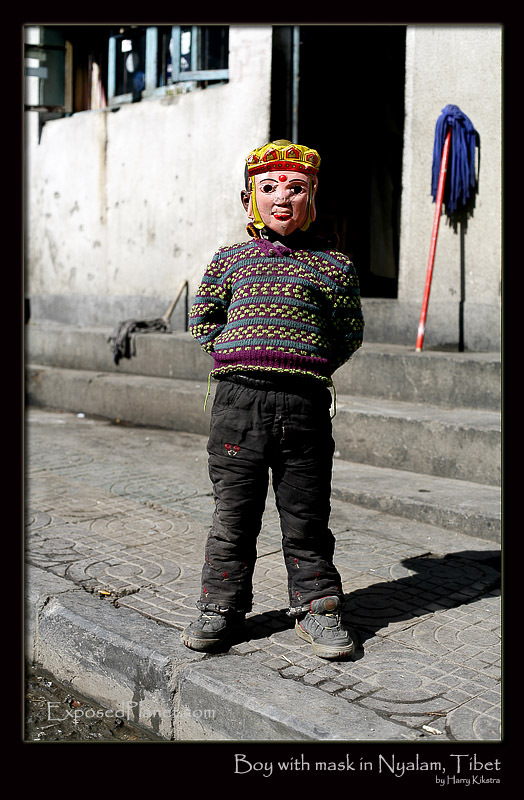 The story behind "Masked child in Nyalam, Tibet"
I have no idea what this child was thinking. He just stood there, did not move nor speak at all, wearing this damaged plastic mask. The dusty towns of Tibet can give an otherworldly feeling anyway, but this made it even more surreal.. I messed around quite some time, deciding where to crop this image, in the end I just stuck to the framing of the original shot, does this work?